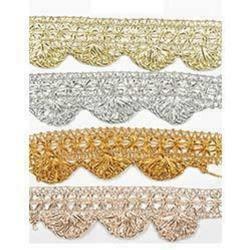 Our range of products include parsi lace 04 and fan lace. With immense experience in this domain, we are engaged in offering an excellent collection of New Parsi Lace 04. The fabric used in designing this lace is procured from the authentic vendors and guaranteed of its quality. Owing to our sound infrastructure unit, we have been able to manufacture, export, trade and supply Fan Lace. These laces are available in various colors, designs and patterns as per the current market trends. We design the offered collection using guaranteed fabric and advanced designing techniques in adherence with the prevailing market trends. Our offered laces do not fade their colors even after washing several times. Ours is an illustrious organization, engaged in manufacturing, exporting, trading and supplying a wide range of Fan Lace. Highly stylish and fashionable, these laces are available in various colors, designs and patterns. Our offered laces are widely appreciated by our clients, owing to their everlasting colors, gleaming look and soft fabric. Moreover, we use premium quality fabric in designing these laces. Clients can avail the entire collection from us at reasonable prices. 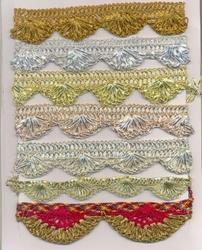 We always endeavour hard to provide a broad range of Fancy FAn Laces to our precious clients. The provided lace is designed in alluring designs that are able to catch the interest of the ladies. This lace is available in vibrant colors, elegant designs, patterns and different lengths according to the needs of the patrons. 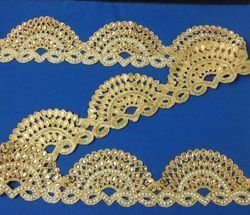 In order to design this lace as per the recent market trends, our adroit professionals use supreme quality threads with the aid of advanced machines. Our thorough search of the modern market allows us to offer an interesting collection of Fan Lace. Known for its unique color, alluring design and glossy finish, the offered collection is the highly appreciated in the market. Our offered lace is designed using superb quality fabric and contemporary designing techniques. Clients can avail the entire collection from us in various designs and patterns at competitive prices.